October 21st, 2014 | Moving Tips. Done packing and think you’re ready to move? Not so fast. If you are leaving an apartment behind and want to retrieve your security deposit, you need to leave the property spotless. Even if you are moving from a house, you still want to clean whatever appliances you are taking and leave the new owners a happy home. No need to rummage through your packed things for cleaning supplies. You likely don’t need to buy new products either-more supplies just mean more things to move. Most of these tips use common household items like vinegar and baking soda. Grout. Mix baking soda and hydrogen peroxide. Scrub the mixture into your grout, let it sit for a few minutes, and then rinse itoff. Also, soak cotton balls in bleach and place onto mildewed areas. Lemon, vinegar, salt and baking soda can be used to clean almost anything. Showerhead. Fill a plastic bag with vinegar, and use a rubber band to attach the bag around your showerhead. Let it sit overnight. Future residents won’t have to worry about clogs or lower water pressure. While you’re cleaning the shower, use a fabric softener sheet to remove soap scum. Drains. For a sink, combine baking soda and vinegar, and pour it down the drain while the mixture is still fizzing. Come back after an hour or more and flush the sink with hot water. For a bathtub, you can add pressure to further strengthen your unclogging power. Pour the baking soda and vinegar mixture, stop the drain, and then fill in the bathtub. Take out the stopper after about an hour. Boiling water and even Alka-Seltzer tablets have also been known to help with clogs. 4. Toilet. Don’t let hard water stains in your toilet bowl give you a headache. Luckily, there are several fixes. You can use a wet pumice stone and a soft touch to remove the rust. Or you can soak some toilet paper in vinegar and set it around the ring. If you’re feeling adventurous, use Coca-Cola. Pour a 12-ounce can of the soda in the toilet bowl, and watch the acidity break down your stains. Oven. Pour 1/2 cup of ammonia into a bowl and leave it in your cool oven overnight. Clean out the next morning. While vinegar and baking soda suffice for a lot of cleaning needs, ovens often require a heavy-duty cleaner-this is a circumstance where you’ll want the extra help. Microwave oven. Soak a sponge or washcloth, and microwave it for about two minutes on high. The steam and vapors will loosen all of that crusted-on mess. Grab the sponge or washcloth using an oven mitt-or a different cloth-and wipe down the sides. You can get the same effect with a small, microwavable cup of water. Stove top. For gas stoves, pour baking soda around the burners. Then add a tablespoon of hydrogen peroxide. Wait a bit, and scrub the gunk away. 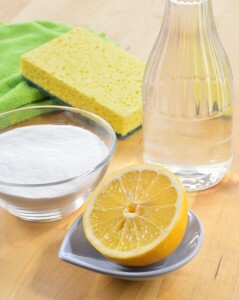 For glass, electric stovetops, you should be able to clean most of the mess with simple dish liquid and water. Use baking soda to break down serious grime. Cabinets. Got a greasy film on your wooden kitchen cabinets from cooking oils and grubby hands? Homeowners have seen success with mixtures of baking soda and water, baking soda and vegetable oil, and detergent and water. Use your favorite combination or whatever items you have on hand, scrub the surface, and rinse with water. Dishwasher. Start by pulling out the filter and washing it as you would a dish. Once you put the filter back in, run the dishwasher on empty. You can either place a cup of vinegar on the top rack or put a few packets of sugar-free lemonade Kool-Aid in the dispenser to clear out residue. Stainless steel surfaces. Buff counter tops, the exterior of appliances, and more with some olive oil on a washcloth. Blinds. Stick your hand in a clean, old sock and wipe down each of the blinds individually. To get rid of extra grime, dip the sock in a mixture of vinegar and water first. Windows. Create a solution with one part vinegar to three parts water. Dunk a towel into the solution and clean your window.Wear gloves if you don’t want to smell like vinegar for hours afterward. Then crumple a piece of newspaper to buff up the window. Carpet. Once again, vinegar saves the day. Most stains will come out with a cleaning solution of 1/4 teaspoon of vinegar (or a detergent that doesn’t contain bleach) and 4 cups of water. For heavier stains, like wine, tea, chocolate, and coffee, use a mixture of 1 tablespoon of ammonia and 1 cup of water. Rubbing alcohol will work on glue or nail polish stains. Use these simple and affordable cleaning solutions to leave behind sparkling surfaces. And most importantly, you can pick up your deposit and head off to your new home in peace.